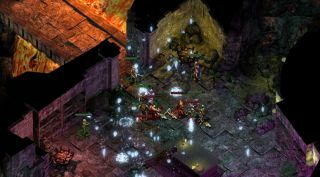 Baldur's Gate: Siege of Dragonspear was originally envisioned as a small expansion to Baldur's Gate: Enhanced Edition, the Beamdog-built update to BioWare's seminal D&D CRPG. But it quickly grew into a sprawling experience of its own, with unique characters, quests, open-world areas, and an estimated 35 hours of play time, covering the gap between the triumph of Baldur's Gate and the unexpectedly unhappy kickoff of Baldur's Gate 2. Beamdog said late last year that it would be out in early 2016, and it has now nailed that down to March 31—less than a month away. Siege of Dragonspear will include four new companion NPCs—a Flaming Fist archer, a boozehound bard, a goblin shaman, and a gnome cleric—and new locations including the Boareskyr Bridge where Cyric slew Bhaal, the act that started all this trouble trouble. (You might say he got the ball rolling.) Despite its size, the FAQ notes that Dragonspear remains an expansion to Baldur's Gate: Enhanced Edition, which is required to play it. Baldur's Gate: Siege of Dragonspear is available for preorder now in the usual standard and Digital Deluxe editions, and also a sweet-looking (and very expensive) Collector's Edition, at siegeofdragonspear.com.